When it comes to bathroom mold prevention, your fan is one of your biggest allies. If you don’t have an exhaust fan installed in your bathroom, it’s seriously time to start considering it – the cost of installation is well worth the amount of time and money it will save by preventing mold from spreading. Turn your bathroom fan on every time anyone takes a shower or bath, and then leave it running for 30 minutes afterward. This will remove much of the moisture out of the air, preventing it from being absorbed into the walls, floor, and other places where mold can grow. This trick is so easy, it’s surprising more people don’t think of it. Once you’re done with a bath or shower, use a squeegee to wipe the moisture off the walls of the shower/bath stall. This will eliminate almost all of the moisture around the tub, striking a serious blow against mold growth. Just because you can’t see mold yet doesn’t mean it’s not there. 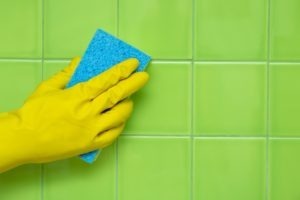 Even if there are no visible signs of mold infestation, it’s worth your time to use mold-killing products to clean the bathroom to fight back against the mold that might already be growing out of sight. Mold-killing products that can be used to clean the bathroom include bleach, vinegar, and hydrogen peroxide. NOTE: Do NOT combine mold-killing products together. These kinds of fluids, especially bleach, can create toxic reactions when mixed. If you have to use more than one product, wait until the first one has either evaporated or been completely cleaned up before applying the second. Mold spores don’t just feed on water and moisture; they also feed on dust particles and other grime that collects on your bathroom’s floors, counters, and cabinets. 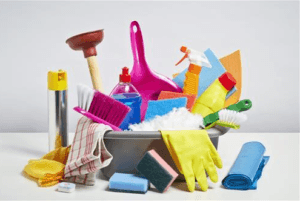 Be sure to use an all-purpose bathroom cleaner on all bathroom surfaces (including the walls) at least once a week, followed by a thorough dusting and cleaning of any glass surfaces with glass cleaner. Even mold-resistant shower curtains can become a breeding ground for mold if not cleaned regularly. After a shower or bath, wipe the curtain down to remove excess moisture, and spread it out as much as possible to allow it to dry. Curtains should also be washed with a washcloth and rag every week, and given a more thorough cleaning every month. Most curtains can be washed in the washing machine; check the tag for the manufacturer’s instructions. For plastic inner linings and curtains that aren’t washer-friendly, soak them in the bathtub with water and bleach (or another type of bathroom cleaner) for 30 minutes, then dry. Want more insights into caring for your bathroom? American Bath Enterprises, Inc. is your online bathroom expert. Contact us today at 888-228-4925.